A slice of heaven all to be discovered! Close to Frosinone, Al Poggio di Casalucense is a big building compound by a nice hotel, the Hôtel Des Rêves, a 3 star that has brand new bedrooms, dated back to 2006, elegant and in a modern style. It also has a SPA and one of the most appreciated restaurants à la carte for weddings in Frosinone. Along the ancient road to Sora, once rose the Posta dell’Olivella, in Sant’Elia Fiumerapido, close to Cassino, a strategic point to rest for travellers. In that same place, nowadays rises a brand new building, enhanced by the nature, that recalls ancient suggestions: the Restaurant Al Poggio di Casalucense. With the luxury Hôtel Des Rêves, the restaurant, suitable for weddings, offers to its Guests the pleasure of hospitality and the excellent taste of the regional coking and an unforgettable stay in an enchanting frame, where history and nature live together since centuries. The Restaurant Al Poggio di Casalucense offers a really reach menù a la carte, with meat and fish-based meals, meals for vegetarians, vegan and for celiacs, high quality wines, and an amazing location for events and banquets, close to Frosinone. 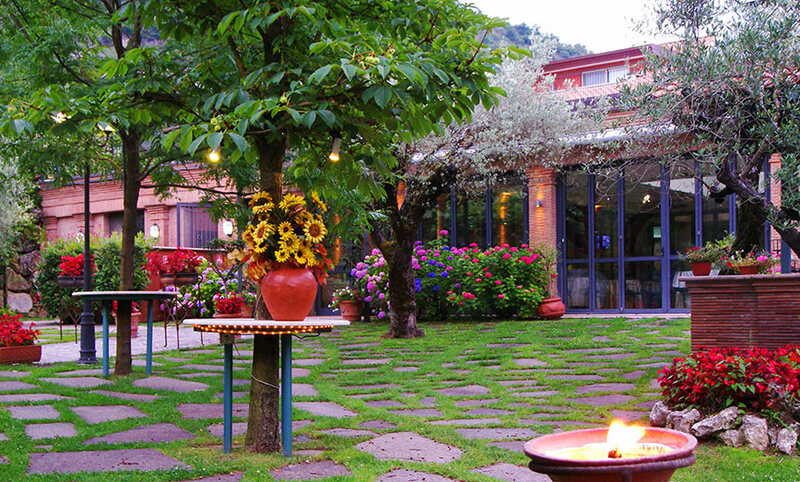 A panoramic garden that surrounds the Hotel Restaurant! The park that surrounds this amazing venue is one of the most ancient with that one of the Gran Paradiso. We are talking about the Abruzzo, Latium and Molise National Park, that spreads its woods by embracing the Poggio di Casalucense, by giving it a sense of peace and an idilliac landscape. Tipycal trees of the Park are the beeches, that compounds it for 2/3 of its surface. Who is looking for a wedding location in Cassino, already knows that a graceful and beautiful oasis like this one is impossibile to be found. A ceremony, a wedding, an anniversary or any other event, always need a warm place, intimate and exclusive: this restaurant that overlooks straight on the woods of the Park naturally gives a touch of magic, both at day, thanks to the brilliant colors of the garden and the brightness of the rooms, both at night, thanks to the light games and the surrounding nature.